There are few individuals who have done more to introduce people around the world to the wonders of olive oil than Carol Firenze, author of The Passionate Olive: 101 Things to do with Olive Oil, whose book reminds people of the wide-ranging value of olive oil beyond the kitchen and will be translated for readers in China later this year. Carol is our very own columnist for Pressing Times, Tip of the Month, where she graciously advises our readership on clever and useful ways to make the most of extra virgin olive oil in everyday life. We thought it was time to talk to Carol about her own everyday life and what inspired her passion for this liquid elixir. When did you first get involved in the olive oil industry? My first answer would be “all my life”. All of my ancestors came from Italy – and from a beautiful region – Liguria (near Genoa, Portofino, the Cinque Terra) where they still farm the family olive grove. I was raised with olive oil and was shown how to use it in day-to-day life by generations of Italian relatives. With a masters degree in History and doctorate in cultural communications, I have always been fascinated by the cultural history of commerce, health and medicine, religion and culinary practices …and to me the olive tree, the olive and olive oil are the connectors. About 20 years ago, my girlfriends and I noticed small bottles of olive oil on the tables at a San Francisco restaurant and we started talking about olive oil. We started our very own EVOOC – the Extra Virgin Olive Oil Club and I told them that someday, I would write a book on the uses of olive oil. I later joined the California Olive Oil Council and was a Board Member from 2004-2006, focusing on marketing and educating consumers to the benefits of extra virgin olive oil. I see two big challenges that we all share as members of the domestic olive oil industry. We have much to teach our customers about extra virgin olive oil (its flavors, qualities, value and uses); and we still face many hurdles to ensure that extra virgin olive oil labeled as such is truly extra virgin olive oil. The product, the process and the people. 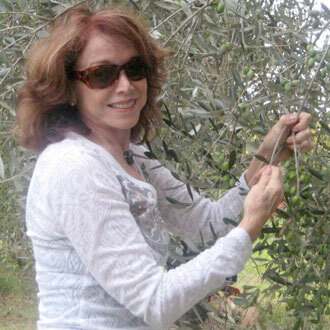 Product: To me, olive oil serves every nutritional, medical and beauty need. If I were to choose just one product for health, beauty, it would be olive oil. Process: Harvesting olives and taking them to a mill and within an hour seeing the golden liquid appear is truly phenomenal. People: From producers to hobbyists, olive oil people are interesting, fun and passionate. The interconnectivity of the olive tree and its fruit to history, religion, health, beauty and culinary arts foster a passion not seen in other businesses. I’ve recently launched an iPhone/iPad application, called GoEVOO – the first app that focuses on finding great Extra Virgin Olive Oil (EVOO) in the U.S. – who makes it, where to find it and how to use it. It makes learning about olive oil fun and interactive! Italy. I visit relatives once a year and for the past two years, have hosted an Olive Harvest Adventure in Umbria, where guests can “Be Italian for a Week”. We harvest olives, take them to the mill, cook with a chef who trains celebrity chefs, attend numerous festivals (from truffles to olive oil to wine to pecorino cheese) and embrace the Umbrian lifestyle, without a throng of tourists. There’s nothing better! Kindness. Being kind to others, the earth, the animals, and one’s self. There is very little food that I do not pair with olive oil. I love vegetables, so any vegetable drizzled with olive oil. I also love troife al pesto and, being from Liguria, pesto made with the buttery, delicate olive oil from the region (taggiasca) is superb. My favorite place on earth is Venice. From meandering through endless mazes of backstreets to enchanting piazzas and squares, Venice is the most unique and romantic of cities. The Basilica of San Marco, the Doges palace, the Bridge of Sighs, the Rialto Bridge… it’s all magnificent. Being serenaded in a gondola on the Grand Canal adds to the ambiance of my favorite place on earth. Raising my son and seeing him as a wonderful father of four. My book, The Passionate Olive: 101 Things to do with Olive Oil, is being translated into Chinese and will be available by September 2011. I have been asked to promote the book in China. I am also working on another book on Renaissance cosmetic secrets using olive oil.